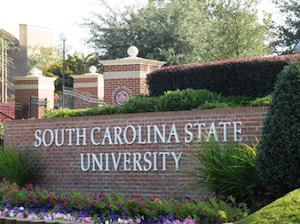 South Carolina State failed to meet eight key standards for accreditation. South Carolina State University, plagued for several years by turmoil in its administration and governance, was placed on “warning” status by the Southern Association of Colleges and Schools (SACS), the major higher education accreditation agency for institutions across the South. SACS, which concluded its mid-year meeting Thursday in Charleston, S.C., cited the state-controlled Historically Black College with failure to meet eight key standards required for accreditation and gave the university 12 months to comply. Questions were raised about the university’s financial resources, financial controls, financial stability, board of governors conflicts of interest, governance in general, control of sponsored research and external funds and management of various federal programs for which SCSU has received federal funds. The accreditation action by SACS comes on the heels of a decision in April by a sharply divided South Carolina State Board of Trustees to hire a new president, effective in early July. Thomas J. Elzey, executive vice president for finance at The Citadel, was hired despite demands from state lawmakers that the board of trustees postpone a decision on filling the presidency until a legislative election could be held in May. That election, according to all involved, was aimed at eliminating several trustees from the board, including the ones who supported Elzey, including board chairman Walter Tobin. Tobin, who served on the board when SCSU was most recently placed on “warning” status, has repeatedly defended Elzey’s hiring despite widespread support for interim president Dr. Cynthia Warrick. Elzey, who has extensive experience in financial management for government and private agencies, is the fifth chief executive of South Carolina State in many years. South Carolina State was one of nearly a dozen rulings the SACS made involving HBCUs. Southern University and A & M College at Baton Rouge, the Louisiana institution rattled in recent years by repeated cuts in state funding, was removed from probation after being cited for shortcomings in documentation of student performance. Its sister institution, Southern University at Shreveport, was removed from warning status. SACS reaffirmed accreditation for Lemoyne-Owen and Lane colleges in Tennessee, Wiley College in Texas and Miles College in Alabama. Meanwhile, Paine College in Georgia remained on “warning” status for 12 months. Aside from SCSU, the mostly good news from SACS follows several years of accreditation reviews that brought as much bad news as good to the nation’s HBCUs, plagued in recent years by enrollment and financial problems. Accreditation by the Atlanta-based agency is critical to these largely tuition-dependent institutions, as the federal government generally does not provide financial aid to students attending an institution that does not have accreditation by a recognized regional accrediting agency. Various private support organizations also reduce or decline assistance to institutions that have less than clean bills of health from accrediting agencies. SACS is scheduled to rule on the status of Fisk University and Florida A & M University at its winter meeting in Atlanta, set for December 5-10. Fisk is in its second year of probation stemming from a number of SACS questions relating to the institution’s financial viability. FAMU has troubles largely stemming from the hazing death of a FAMU band member in the fall of 2011.